OTTAWA — The RCMP should have alerted Justin Trudeau's protective detail that Jaspal Atwal — a man with a serious criminal record and a history of violence — might turn up during the prime minister's February trip to India, says a review of the turbulent visit. The newly released report from the national-security committee of parliamentarians says the RCMP "recognizes that it erred" in not passing along the information about Atwal, who had been convicted of attempted murder years earlier. The heavily censored report, tabled Monday in Parliament, says government agencies do not have a comprehensive system for vetting guest lists for foreign events involving the prime minister and have not conducted a "lessons learned" exercise to determine what they could do better. Atwal was photographed with Trudeau's wife and at least one cabinet minister during a Feb. 20 event in Mumbai, and an invitation to a second event, in New Delhi, was rescinded after the news broke. The committee report says the Mounties had information on Feb. 13 about Atwal's possible presence in India during Trudeau's visit. "That information caused RCMP personnel to search criminal databases, revealing information that should have triggered the notification of the Prime Minister's Protective Detail and the briefing of senior officials: neither the Protective Detail nor officials were notified," the report says. During closed-door testimony, the RCMP acknowledged that mistake and a failure to follow up on direction to determine Atwal's whereabouts, the report says. Several days later, in an exchange whose details are redacted for security reasons, the same unit received some sort of information on Atwal, but because it was the end of a shift, the team "decided that it would wait until the next day to validate the information." 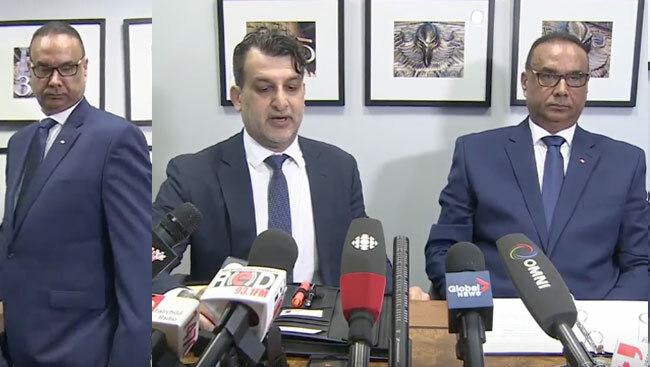 The committee report says this assertion "was questionable, at best," adding the conclusion of security and intelligence officials that Atwal posed no danger "was based on a narrow interpretation of risk." Trudeau's national-security adviser, Daniel Jean, suggested during a background briefing for media in February — after Atwal's presence had raised questions — that factions in the Indian government had sabotaged Trudeau's trip. Jean advanced the theory that rogue elements in the Indian government arranged for Atwal’s presence in a bid to prevent Prime Minister Narendra Modi from becoming too cosy with Canada's government, one they believe is sympathetic to extremist Sikh separatists. The committee report says some of the issues raised by Atwal's presence in India would have been more properly addressed by the Prime Minister's Office, including failures to screen invitees to Trudeau's events. The committee, which includes members of the House of Commons and the Senate, announced in April that it would study questions about the trip, including allegations concerning risks to the prime minister's security, foreign interference in Canadian politics and inappropriate use of intelligence. Fines are going up for anyone who uses off-road vehicles and snowmobiles in environmentally sensitive areas of British Columbia. Anyone operating the vehicles in those areas will face a $575 fine, effectively immediately. MONTREAL — One of the doctors who worked the boxing match Saturday night in Quebec City that left Adonis Stevenson hospitalized in an induced coma said he and his colleagues are at a loss to medically justify the sport. TOFINO, B.C. — A British Columbia wildlife refuge says staff are upset and shocked after a bear cub that was rescued near his mother's dead body this spring died unexpectedly in his enclosure.